Is a Single Dam Enough to combater Water Crises? Raising of Rice and Sugarcane – Bane or Boon? Revision of Urban Water Tariffs. Whether a single dam is a panacea to all of Pakistan’s water woes is, of course, questionable. Consider the facts: per capita surface water availability of 5,260 cubic meters per year in 1951 turned into around 1,000 cubic meters in 2016. This is likely to further drop to about 860 cubic meters by 2025. The PCRWR describe that Pakistan reached the “water stress line” in 1990 and crossed the “water scarcity line” in 2005. The Indus river system receives an annual influx of about 134.8 million acre-feet (MAF) of water. The mean annual rainfall ranges from less than 100 millimeters to over 750 millimeters. Surface water comprises glacial melt up to 41 percent, snowmelt up to 22 percent and rainfall 27 percent. 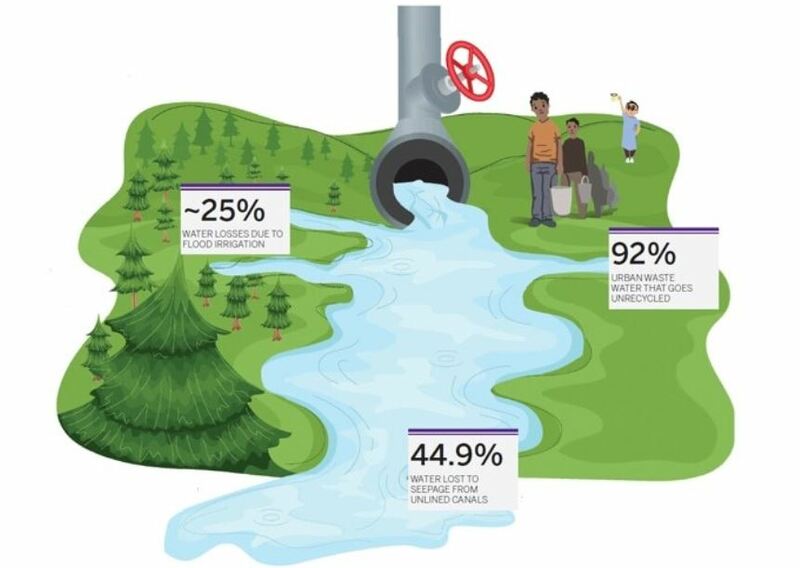 In terms of groundwater, Pakistan is currently extracting 50 MAF from underground aquifers — this has already crossed the sustainable limit of safe yield. The 1960 Indus Waters Treaty (IWT) enabled Pakistan to enhance water availability at canal headworks to about 104 MAF through the construction of dams. However, this has decreased due to increased siltation. Because many people’s livelihoods are tied to growing more rice and more sugarcane, these crops will remain popular. Without any education or awareness about how not to waste water or how to utilize efficient irrigation methods, the wastage will continue. While doomsday is just seven years away, it took over 70 years for Pakistan to draw up its first-ever National Water Policy (NWP), approved in April this year. The policy is still riddled with some significant gaps but at least, it lays out a few principles that ought to be adhered to. But in some ways, it is merely a compilation of suggestions. The Pakistan Economic Survey, 2017-2018 notes that while the rice was sown over 2,724 thousand hectares last year, it rose to 2,899 thousand hectares this year. “[H]igher domestic prices and availability of inputs on subsidized rates, good advisory along with an increase in export,” according to the survey, contributed to more land being used to grow rice. This 6.4 percent increase ultimately yielded a production high of 7,442 thousand tonnes. Last year, 6,849 thousand tonnes of rice were produced in Pakistan. There is a flip side, however. More water is utilized in growing these water-intensive crops. For instance, sugarcane requires 1,500-2,500mm of rainfall (or water from other sources) to complete the growth cycle. In other words, to produce a kilo of sugarcane, between 1,500 and 3,000 liters of water are utilized. Similarly, at 0.45 kilograms per cubic meter, Pakistan’s rice water productivity is 55 percent lower than the average water productivity of one kilogram per cubic meter for rice in Asian countries. It follows, therefore, that a country tethering on the edge of water scarcity ought to de-incentivize the growing of water-intensive crops. In practice, this means convincing the farmers that they will not be hit by a financial loss were they to switch to other crops. The NWP acknowledges that irrigated agriculture is the backbone of the economy and consumes around 95 percent of the water resources. Furthermore, around one million tube wells in the country pump about 55 MAF of underground water for irrigation, which is 20 percent more than what’s available from canals — signaling how highly water-intensive the agriculture sector is. This is all unsustainable. On the other hand, while there is great water wastage in the rural sector, providing potable water to the cities has become a challenge. One of the more achievable targets set by the NWP is the access to clean and safe drinking water and sanitation facilities for all. Towards that end, the policy has also urged the promotion of greater urban water management and revision of urban water tariffs. It also encourages enhancing recovery and reducing system losses, treatment of industrial effluents and provision of the sustainable supply of water for everyone. But it is still the agricultural sector whose water utilization needs to be under the microscope. Till now, the policy seems divorced from the financial compulsions of those whose livelihoods are associated with the agricultural sector. Dr. Pervaiz Amir, director of the Pakistan Water Partnership (PWP) believes that policies are designed and implemented for the people and the civil society should have been engaged in debates and discussions towards this end. For him, the federal water ministry is weak and there is an urgent need to strengthen the Water and Power Development Authority (Wapda). Dr. Tariq Banuri, the founding executive director of Sustainable Development Policy Institute (SDPI), a senior climate expert and currently heading the Higher Education Commission (HEC) as its chairman, agrees that Pakistan is wasting its water resources due to inefficient consumption patterns and negligible recycling. ← How does GPS work on Phone?